Very strange idea here. If you aren't aware of Phranc, she's a lesbian with a male image that does femme pop. So, naturally, she picks up on the surf thing 'cuz it's so macho. Why, she's even ridin' a big old long board on the cover while strummin' her mighty acoustic ax. The lead track is a vocal number about lesbian surfers called "Surferdyke Pal" that's funny enough. Then there's a couple of ho-hum numbers, including covers of Bobby Gentry's "Ode To Billy Joe" and Herman's Hermits' "Mrs. Brown, You've Got A Lovely Daughter". So, why am I telling you this? Because, the 5 song CD closes with a pretty cool surf instro, where she plays an acoustic surf tune backed by a real live surf band. Phranc plays acoustic guitar backed up by Satan's Pilgrims. It's not the Lively Ones' tune, but it is pretty unusual and cool, though very badly mixed, with the lead guitar much to buried. 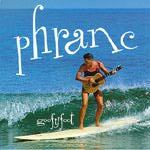 Phranc's occasional vocalizing is nearly missing in the mix, but her utterances of "Hey Goofy Foot" are priceless. This is a very rhythmic track. Boffo deluxe!